Remember, we are located in front of the Spain Embassy. 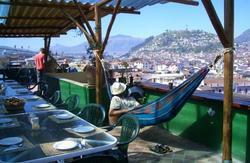 Travellers Inn is the best option in Quito with a charming and familiar environment, so you will feel at home! If you want to experience the culture, this is an ecuadorian family bussiness. Run by Pilar, even she speaks 'poquito' English, you will always be greeted with a smile and offered care and personal attention. Our staff will always try to suit your needs and there is always someone around who speaks English, German, Norweigan, Spanish and French. We have first quality bedrooms (no bunk beds), with private/shared bathrooms and 24 hours hot water, TV, cable TV on living room, phone, free Wireless Internet, security boxes, wake up call and daily room service. We offer Free High Speed Internet, parking, laundry service (USD 1,50 per kilo), Spanish lessons (USD 4 per hour), Bike rental, 24 hours reception and no curfew. For your comfortable stay, we have adopted full security measures. We also have a Restaurant service available. Inside Travellers Inn, there is a Travel Agency offering tours to anywhere in Ecuador, airplane tickets and the best tours to the Galapagos. Our guides, drivers and employees are all professional and they speak English, Spanish and French. We have the last technology for purifying water, using 6 processes, so you can enjoy our fresh juices in your breakfast or any drink you have. We support the Earth with our different campaigns: Reduce, Reuse, Recycle. There are communal areas and yards. There is a beautiful garden and you will wake up with the singing birds, which is admirable in the center of the city. We are located within walking distance from the best bars, clubs, restaurants, etc. But, at the same time, in such a quiet environment for a relaxing night. - Huge Breakfast Included (Restaurant service available), Free Maps of Quito and Pichincha, Free Internet and Free Wireless Internet, Free Travel Information and advice, Spanish Lessons (USD 4,00 per Hour), Laundry Service (USD 1,50 per Kilo), Bike Rental (the lowest rates in Ecuador), Fully Equiped Guest Kitchen Available, Mini Bar (the lowest prices), No Curfew, Free Luggage Storage, TV and Telephone in Every Room (Wake Up Call), Private/Shared Bathrooms (24 Hours Hot Water), Free Towels and Linen Included, The Best and Cheapest Tours, Nice and Friendly Staff, Credit card payments only Visa and Mastercard with 8% surcharge and Lots More...! We have very reasonable rates for airport pickups. To be able to give you a quote, we need all your flight details, such as: Day, Date, FLIGHT NUMBER and arrival time. Huge Breakfast, Internet & Wireless and All Taxes are included on the price. 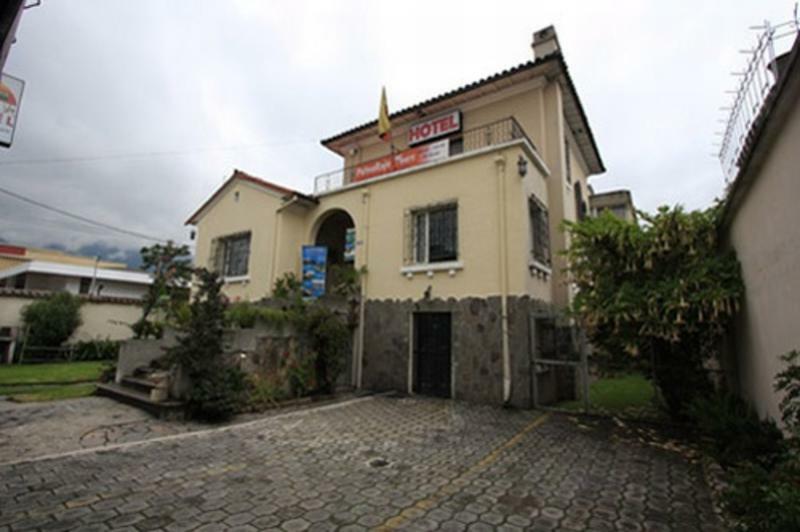 It is located in the main commercial, cultural, tourist and entertaiment area in Quito, close to everything that you need. Just 10 minutes from Quito Old Town, by car. From Quito International Airport you can take a bus or a taxi from any point of the city and get to La Pinta St. E 4-435 and Amazonas Avenue, two blocks south from Marriott Hotel. We also include a nutritive courtesy breakfast, so you can start your day in good shape. It is located two blocks south from Marriott Hotel and four blocks away from Holiday Inn. It is close to the main recreational park of the city, La Carolina Park, and next to Amazonas Avenue, where every sunday, you can enjoy of your freedom in a Bike Ride, called 'Ciclopaseo', or the activity that you prefer.